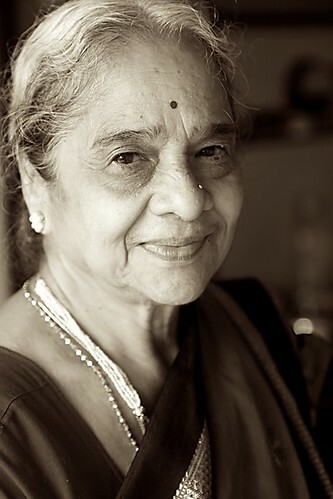 With her freshly powdered face, wearing a big red bindi on her forehead, saree neatly in place, bangles clanking, my grandmother entered the kitchen each day to turn out the fluffiest puris, melt in the mouth gulab jamuns, jaggery laced pancakes (holiges), soft golden besan laddus and crsip rice flour spirals (chaklis). These were treats reserved for numerous festivals and other celebrations. Vegetables cooked with the right amount of spices, lentils, rice, chapatis and bhakris (unleavened bread made with sorgum flour) and other delights were daily fare served with love, care and attention to my grandfather and other visiting relatives and friends. These are my fond memories of my grandmother as a child who spent every school vacation with her maternal grandparents. My grandfather�™s untimely demise when I was eight years old changed a lot of equations for my grandmother and the rest of the family. But her spirit still remains the same. The many bangles that adorned her nurturing hands and the big red bindi that dotted the forehead of her flawless face is gone but the powdered face that shows an energy and zest for life still remains. And fortunately for me her interest in cooking also remains and I have gained so much knowledge from her expertise in cooking. And I still continue to learn. 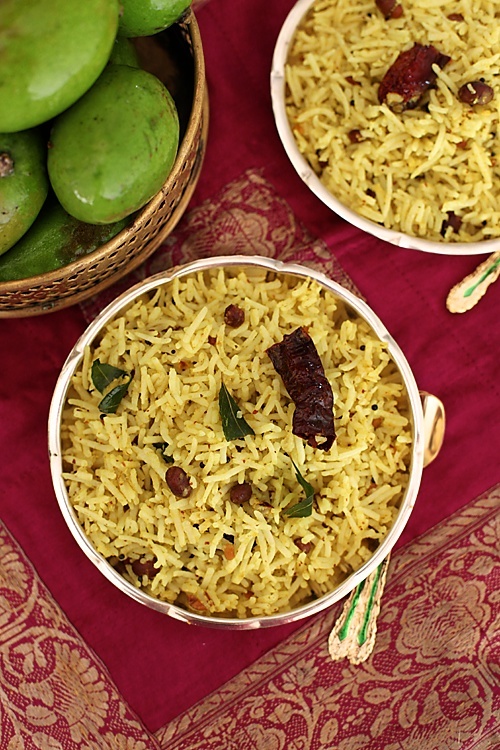 Like this traditional rice made with raw mangoes that has been eaten in her family from generations. In my mother�™s kitchen, she sat and guided every step while I continued to make this. “You make anything, you get the seasoning right and you get the dish right and if you mess up the seasoning then the entire dish is gone”, she said while I put the oil into the seasoning pot. 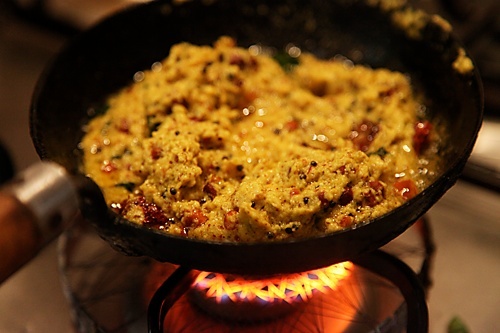 Seasoning (tadka, tarka, chaunk) is such an important part of Indian cooking! 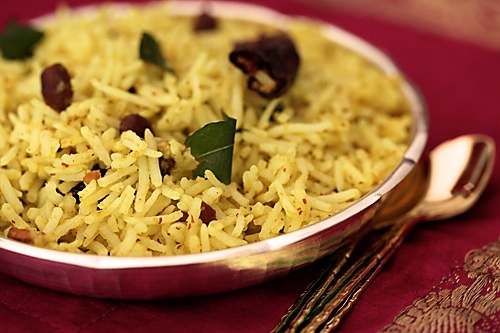 It can perk up plain old rice or make good old dal a delight to eat! I arrived at my parents making a lot of plans to develop new recipes. But life had other plans as my 2 years and 2 months old toddler developed a temperature of 38.8 C for the first time in his life. Without his father around, he clung to me every second of the day until the fever settled with some paracetamol but gave way to a nasty cough and cold. Again, my grandmother came to the rescue and eased the cough with her home made medicine. Just as my baby was settling in, my nasty allergic cold brought life to a standstill yet again! Maybe all the fried goodies I have been gorging on or maybe the weather…hard to say! 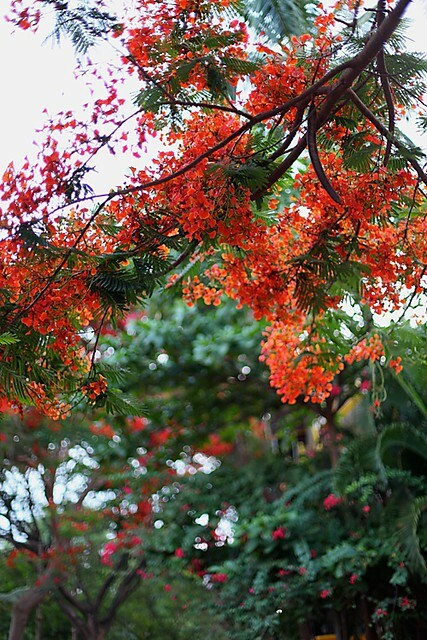 The one respite which has been cheering me are the beautiful gulmohar blooms across every street in my parents neighbourhood! 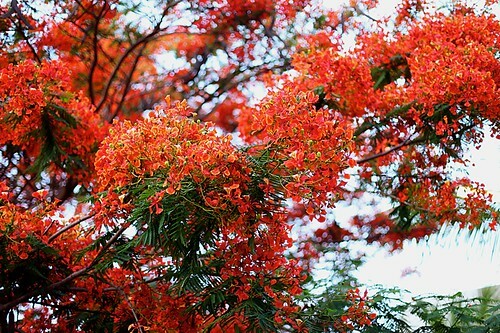 Isnt it simply amazing how flowers can heal, cheer and bring colour to our lives? Wash the basmati rice in two to three changes of water and place in a bowl, covered with water. Allow to rest for half an hour. Drain the water and cook in an electric rice cooker with the 3 1/2 cups water and salt. Alternatively, cook in a pot with a tight fitting lid by placing the rice, water and salt and bringing it to a boil on a medium flame and then cooking it covered on a low flame for about 12 to 15 minutes. Allow the rice to cool completely. Assemble all the ingredients for grinding and in a blender or food processor grind to a fine paste without any water since the mango already has a lot of water in it. 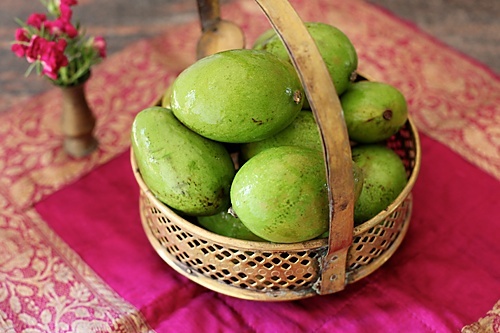 If you find that your raw mango is a little dry then grind to a paste using very little water. In a small saucepan or a seasoning pot, prepare the seasoning. Heat the oil over a medium flame, then lower the flame a bit and put in the bengal gram dal and black gram dal. Stir for a few seconds and then put in the peanuts. When the dals begin to change colour, add the mustard and allow them to pop. Lower the flame and put in the dry chilies, stir and add curry leaves and asafetida. Now, put in the ground paste, turmeric and salt and cook until the oil separates from the ground paste, about 3 to 4 minutes. Mix the cooked & ground paste with the cooked and cooled rice. Such a wonderful post Anu….I've already fallen in love with your Grandmom she's sooooo cute….reminds me of mine….the way these granny's guide us in kitchen….and come to our rescue with their home remedies when we r not well is just the best part of life…. wow! i remember ajji and her smiling face. awesome post! @Shruti: So true! Grandmother's are like fairies from heaven who bring so much beauty to life. 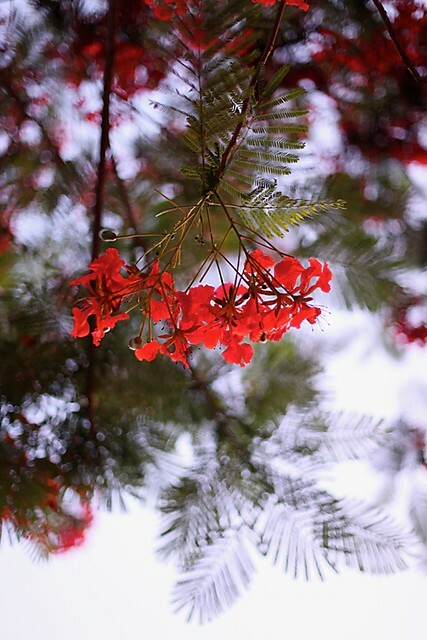 @Pratibha: Thanks for pointing it out! @Sharmilee: Thank you…she is so beautiful even now and her recipes are such a delight! Hope you like it! 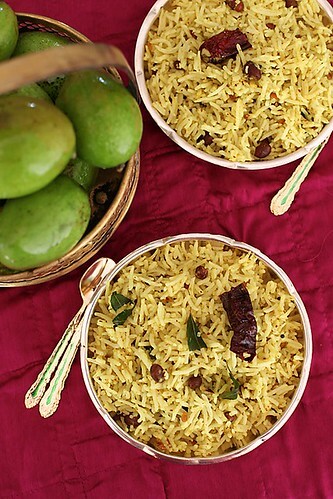 Ur grandma looks soo beautiful,tongue tickling mango rice..
You make me miss home with that Chitraanna pics! Sitting miles away I can only watch and drool..Thanks for posting this recipe! Your grandmother is beautiful and the recipe looks sensational! Hope your little one is better soon. lovely to read about your grandmother. i really miss mine..
urvi: Will post a recipe some time. There are a lot of pending requests and I hope you will be patient with me.